"The music these two masters of improvisation created that sunny afternoon in Rhapsody, is simply breathtaking"
Harry and Michel, our good friends and advisors from the High End audio shop ''Rhapsody" in Hilversum, were celebrating the shops 25th anniversary. They invited master bassist Tony Overwater and pianist extraordinaire Bert van den Brink to come and play a concert in the listening room of the shop. The room was filled to the brim with audio enthusiasts, the closest listener being just a few feet from the musicians and the microphones. When the audience is so close to the musicians, a synergy occurs. The audience becomes part of the music making and help spur the musicians on to great heights. The musicians feeling the empathy from the audience dare to take chances that one rarely hears in a studio recording. 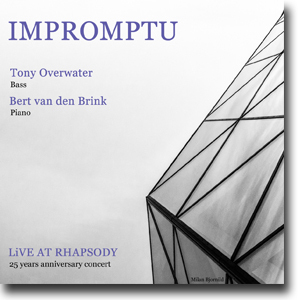 Tony and Bert had not performed together as a duo before, and no rehearsal had taken place prior to the Rhapsody concert, but the music these two masters of improvisation created that sunny afternoon in Rhapsody, is simply breathtaking. The recording conditions were not ideal. The doors in the back of the room were opened several times by people trying to squeeze in, making the sound from the espresso machine in the hall and the DJ playing ambient music in the garden faintly audible at the beginning of each set. Later halfway through the concert the windows of the room had to be opened for air. The DJ turned off his music but he was immediately replaced by the sound of birds singing. If listening closely one can hear them, chime in, in the quiet parts. These outside factors contributed to the unique atmosphere of this recording and that is yet another reason why; Impromptu (a musical composition prompted by the spirit of the moment) is such an apt title. Special thanks to Harry and Michael of Rhapsody Sound&Vision for making this recording possible. We're always impressed by their professionalism and endless enthusiasm. We also like to thank Henk Hupkes for the great piano (HHB-2).